Growing starter plants for your home veggie garden is a great way to make sure your plants have a strong organic start. Whether you live in the north where your summertime is limited or in the south where summers reign most of the year, starting plants can be both easy and a frugal way to garden. But starting your plants indoors is only part of growing a successful batch of seedlings, you need to prepare those plants for your weather. 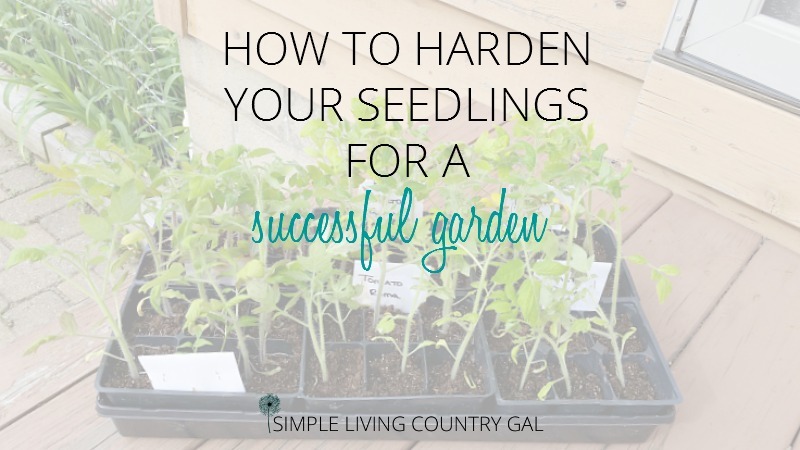 This post will show you how to harden your seedlings for a successful garden. When I first began growing my own plants from seed, I truly thought once the plants were big enough and the weather was warm enough the plants went into the ground. Unfortunately, I soon found out there was more to it. That first year I lost quite a few plants because of a cold snap. Not so cold there was a frost, but much much cooler than my poor little seedlings could handle. Little did I know I could have prevented all of this by doing one simple thing. Luckily this is super simple to do, so don’t worry gardening newbies! When you are starting plants indoors your success all depends on your timeline. Your timeline is based on where you live. This is called your zone. Once you know your zone you will know the best time to plant any plant in your area. Learn your zone and remember it, I promise you will need it often. You can use this handy tool here to help you out! In Northwestern Pennsylvania I like to begin my plants indoors in my redneck sophisticated growing system. I start my peppers in February, tomatoes in March, and my vine plants like watermelon in April. This basically ensures that my plants will be a perfect size come May when I plant. More or less I came at this time frame from trial and error. I used the suggest plant times found for my zone and kept pretty thorough notes in my gardening journal. 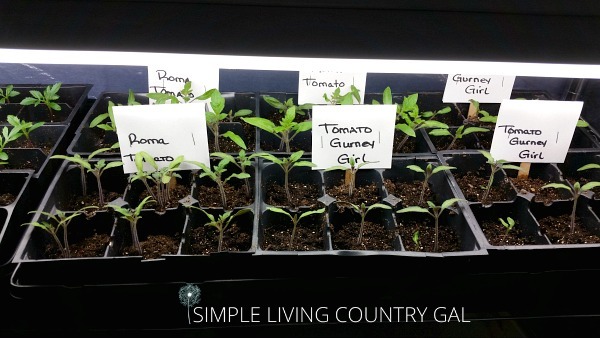 I wrote when I started my seeds and how big my seedling plants were come planting time in May. If the date needed to be adjusted I would make a note of my new planting schedule for the following year and put a note in my calendar file. Ninja tip: This file is a game changer for me. Once I know my reminder is in there I can let it go. There is nothing worse for me than mind clutter! You see, I check that file every new month making notes on my family calendar as I go. Come February and March I will see my note of what to plant and know the new date for my seeds. Super simple! I also have a gardening prep and planting schedule as well. I know my plants need to be in the ground the last week of May until the 2nd week of June to make sure they have plenty of time to grow and produce. Now, this is all great. Once you have your schedule and your plan of attack you are all ready to go…right? Nope, there is still one more thing you need to do. Harden your seedlings so they can better handle any late weather cold snaps that may hit unexpectedly. A sunny place is best but be careful. Too much sun can very quickly dry out your plants especially if they are still in those little seed trays. Watch them close and water as needed. Watch for high winds as well. If you have a windy day you can still put your plants outside, just keep them close to your house for protection or put them under a woven deck chair so they still get some sun but the winds cannot hurt them. [spacer height=”20px”]If you have quite a few plants to harden up, taking them in and out each day can be quite a task. 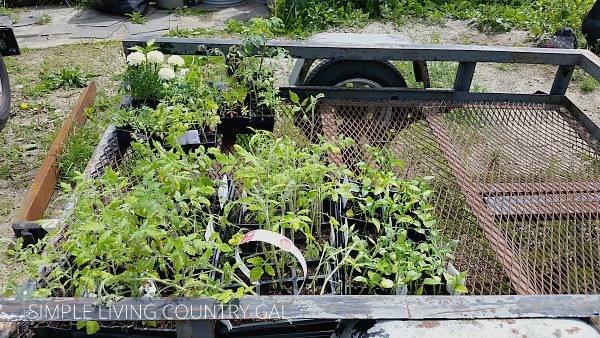 I like to put them on a cart that can be easily wheeled in and out of our barn or garage. A wagon works well too! I just put them out for a few hours the first day working my way up to full days and some early evenings as well. Each night they come back into the house. At this point, my plants are big enough not to have to go back under the grow lights. 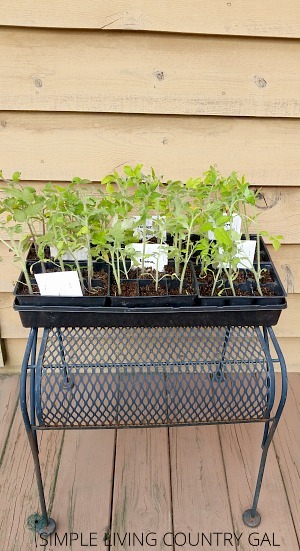 I will continue to harden my seedlings like this for up to a week increasing the time spent outside with each day. Eventually, your plants will become stronger and better able to handle those chilly nights. Now you are ready to put your little seedlings into your garden without the risk of damaging your plants. There is nothing better than fresh organic vegetables from the garden. No more excuses kids! 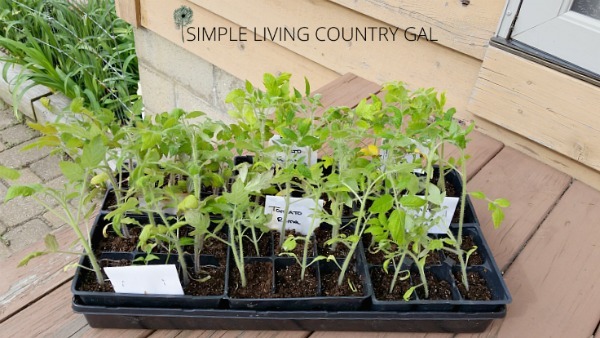 Gardening is super easy, fun (yes…even the weeding!) and so rewarding. 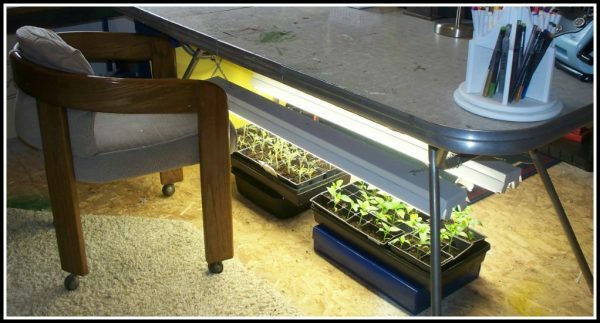 Start your plants indoors with organic seeds, take the time to harden your seedlings, prepare your soil, and mulch your garden and you will have a harvest to can and fill your winter pantry with. Now get out there and get your hands dirty peeps!